Now that Autumn has officially begun, Swagbucks is offering a bonus for you in the form of Autumn Harvest Collector's Bills! 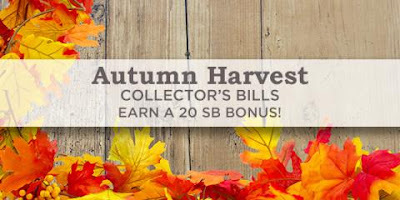 "Collector's Bills" are special designs that you win randomly while searching the web with Swagbucks' Yahoo-powered search engine. Collect all 6 and you get an additional SB Bonus! Once you've collected enough SB, you can redeem them for gift cards to stores like Amazon, PayPal Cash, and many more!